Dr. Dulin is waiting to welcome you to the Pointé! It’s not easy visiting a new church for the first time. For some people, the hardest part is getting out of the car in the parking lot and walking to the main entrance. As you walk you’ll probably have a number of questions running through your mind: Will they be friendly? Will they know that this is my first time? Am I dressed appropriately? Will they ask me for money? Will my children enjoy it? Do I have to participate in everything or can I just sit and watch? Hopefully, these questions will lead to an experience at Central Pointé that is pleasant, encouraging, and challenging—all at the same time. Our goal is for you to leave our assembly feeling like you encountered the presence of God in a memorable way. If you’re nervous about attending or if you’re just curious, then keep reading for an overview of what usually happens on a typical Sunday morning at Central Pointé. This way, when you walk in, you’ll already know what to expect. 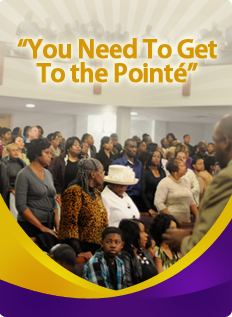 We look forward to you having a wonderful experience during your visit to The Central Pointé Church of Christ. When you walk in the door our greeters will be waiting to welcome you. They will have a church program for you that explains what we believe, gives you an order of worship and details about what is happening in the church that week. There are entrances to The Pointé, at the Dallas Campus, on both the Westmoreland Road and Gannon sides of the building. When you arrive at Central Pointé for the 10:30 am worship assembly, you’ll find plenty of parking. As you drive up you should see parking spaces, toward the front, reserved just for our visitors. As you walk in, you should be met by some friendly people (we call them “greeters”) to say hello, answer any questions you have, and direct you to the Worship Center. Worship is straight forward at The Pointé. Morning worship starts at 9:00 am at the Mesquite Campus and 10:30 am at the Dallas Campus. We have separate Children’s Worship services for ages 4-10, which are held in the Dr. R. B. Dulin Children’s Worship Center. The lessons are age appropriate and designed to promote participation by all young people. If your children are shy or if you’d rather they remain in the assembly with you, they’re welcome to stay, but most children really enjoy the activities fostered within this environment. They can stay from class through worship, and you can pick them up after worship. Security is incredibly important to us. We’ll give you a child ID card for you to use when you pick up your child. We commit to doing everything possible to keep the area secure with trained Children’s Ministry volunteers in the area with children. When you enter the main auditorium, you will find us involved in a time of praise and worship. Dr. Dulin is scheduled to preach at all of our worship services unless otherwise noted in our bulletin. We want to make sure you feel welcomed. Visitors are asked to raise their hands, at which time the ushers will give you a visitor’s and the congregation will sing our welcome song. You will not be asked to stand or say anything. We do ask that you fill out the welcome card. There will be an opportunity for you to turn it in following worship. If you fill out a card, we’ll contact you soon after the assembly to thank you for attending and ask if there is any way we can be of service to you. We want to know more about you and, in turn, tell you more about us. One way we do that is by giving you some good information about the Church of Christ. A message from Scripture is given weekly, which lasts about 30 minutes. And every week we take Communion (also known as the Lord’s Supper) together. Communion is the celebration of the life, death, burial and resurrection of Jesus Christ and the salvation we enjoy because of Him. The assembly will usually come to an end around 12:30 pm. Believe it or not, if you’re actively participating in the assembly, it will go pretty fast. After the assembly, you can pick up your children from Children’s Worship, and then we hope you’ll stay around and get to know us, and let us get to know you. That’s about it. I hope you’ll stop by this Sunday. If you have any additional questions, email us at cpcoc@swbell.net. What can I expect during Bible Class? A next step for you is going to a Bible class on Sunday morning @ 8:00 am at the Mesquite Campus or 9:30 am at the Dallas Campus, Tuesday morning @ 10:00 am or Wednesday night @ 7:00 pm. Our goal for Bible classes is to create an engaging environment for Bible study that stimulates participants to read the Bible on their own. We lead specific classes for adults on Sunday mornings: a men’s, women’s, marriage, single’s and new convert’s class for in-depth Bible study specifically empowering God’s children to be disciples of Christ. There are also age appropriate classes for children of all ages. Additionally, we have Bible Class on Tuesday at 10:00 a.m. and Wednesday at 7:00 p.m. Dr. Dulin or one of our Shepherds will provide an intimate setting during Bible Class. Lessons are taught from the floor and presented in a conversational style, and on occasion, engages in questions and answers. There is a praise and worship time before the teaching moment. Visitors are encouraged to come and enjoy the class.